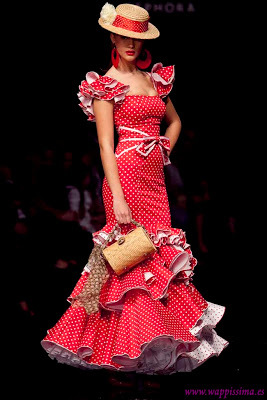 Home Tags Posts tagged with "Flamenco"
After so many previews, here are the final pictures of the flamenca dress. Enjoy! As I didn’t know if I was going to be able to take good quality pictures during the Andalusian party, we decided to go to the park before and have a little impromptue photoshoot. 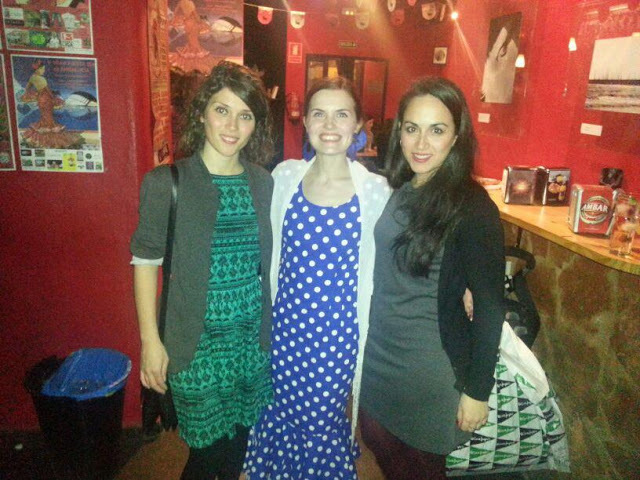 And just so you can see my accessorizes (blue of course), here is a picture from the party with my friends Mari Paz and Pilar (who brought from Sevilla the beautiful flower and earrings. Thank you Pilar!). 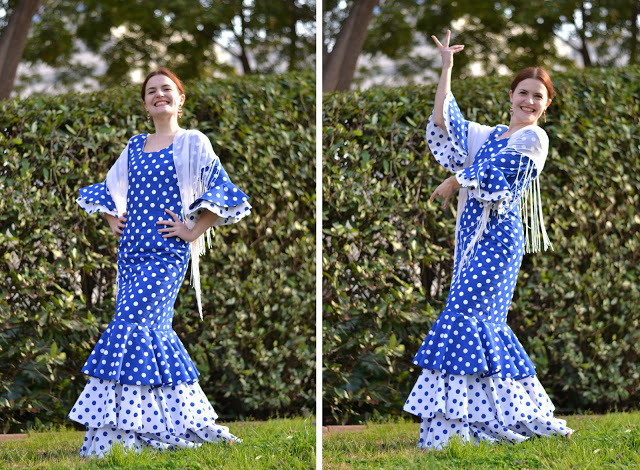 I hope you enjoyed the flamenca dress series and if you have any question, feel free to ask, I’d be delighted to answer (or try to…)! 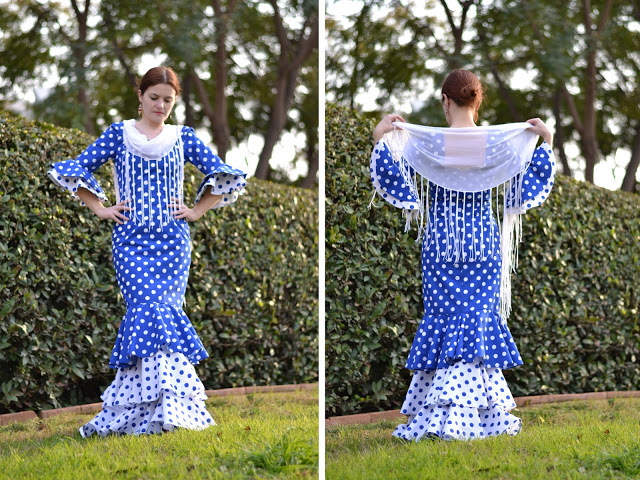 Let’s follow yesterday’s post and continue on the flamenca dress. 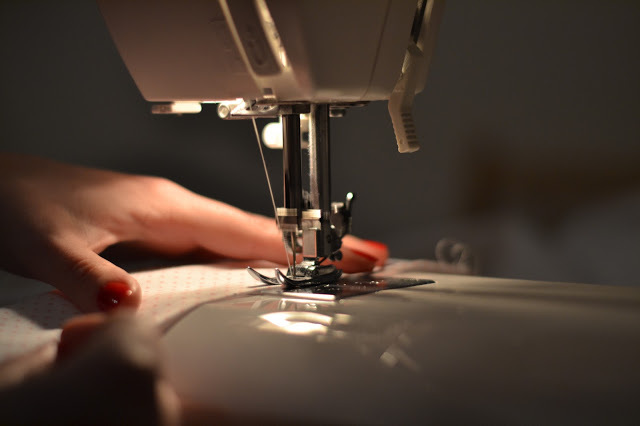 We have set the the sleeves in the body and attached them to the lining, what we need to do now is make the skirt, join it to the dress, sew the zipper on and we are ready to hit the street. I chose not to line the skirt flounces (contrary to the sleeve ones) because the outside is not going to show and it takes too much fabric (I might never wear this dress again for all I know). 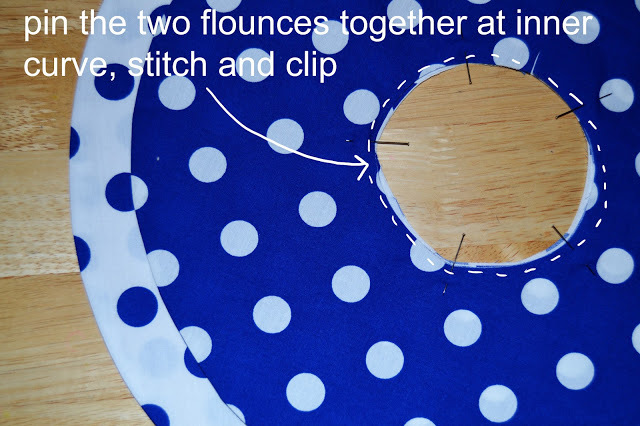 1-Sew together all the circles of the same colour so you obtain one big flounce. 2-Stitch a row of basting along the inner curve of the flounce and clip (like for the sleeve). 3-Here is a drawing (very bad!) 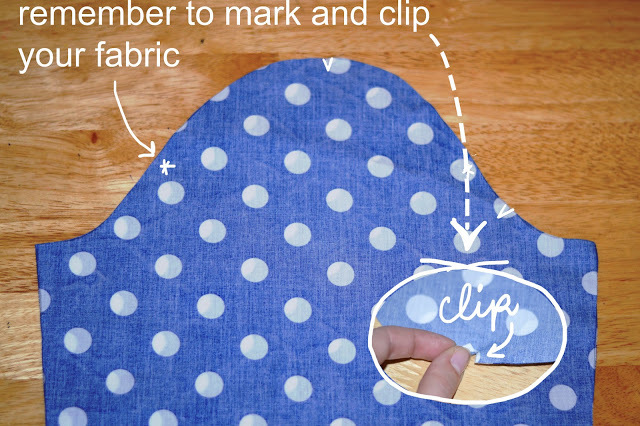 I made to explain how to place the flounces on the skirt. 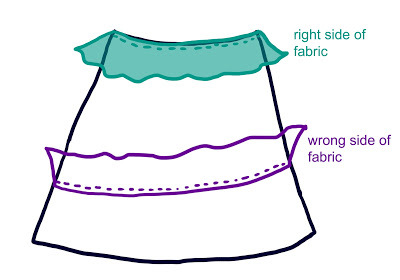 You see that the first flounce is sewn right side up and the following ones wrong side up with the flounce facing upward (that way, the seam allowance is hidden nder the flounce when folded). 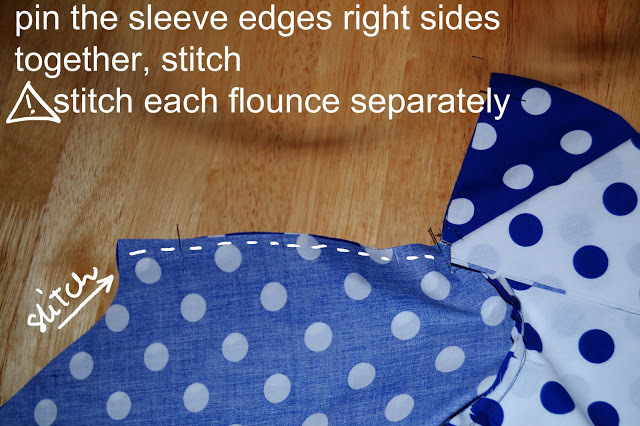 4-Repeat step 7 of the previous post to sew the back the dress (remember to sew each flounce separately). 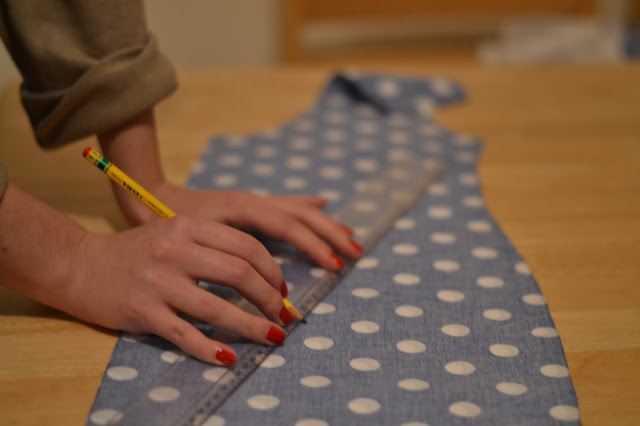 5-Baste the zipper and sew it to the dress. 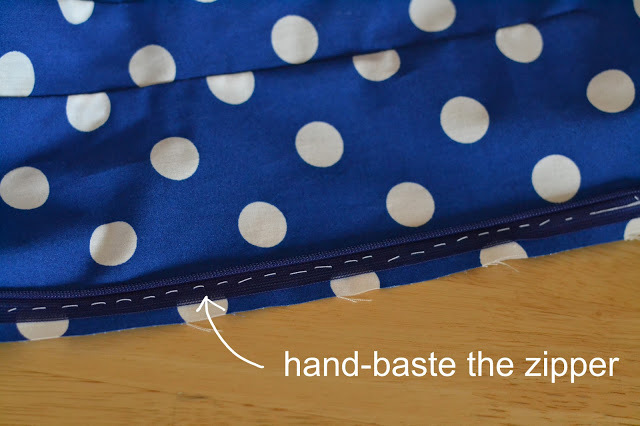 Attach the lining to the zipper and hem it where the bodice meets the skirt. 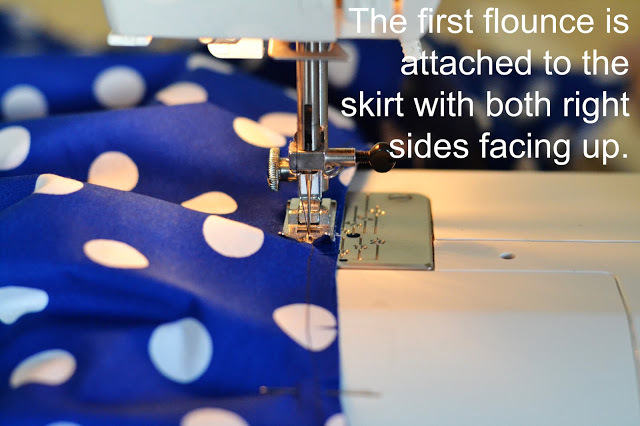 6-Hem the skirt and the flounces as you choose (decorative binding, turn in hem…). I wish you all a nice week and I leave you with this picture (the “real” post is coming in a few days, I promise). 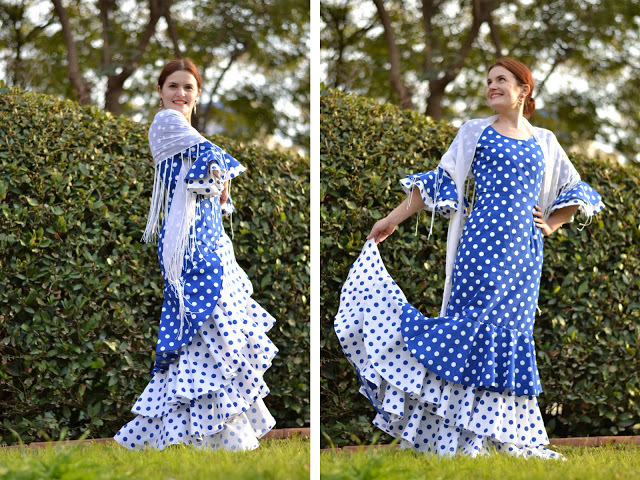 I am getting ready right now for the Andalusian party tonight so I thought it would be appropriate to make a new post about the flamenca dress. If you remember, I already made the dress body and the lining. 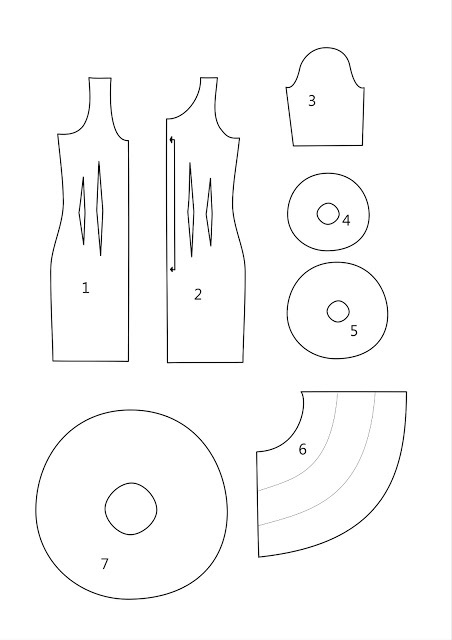 Which leaves me the sleeves and the skirt: these are the parts that are more time-consuming. Today I’ll start with the sleeve and tomorrow the skirt part will follow. For the sleeves, I decided to line the flounces with self-fabric as the outside is going to show quite a bit. 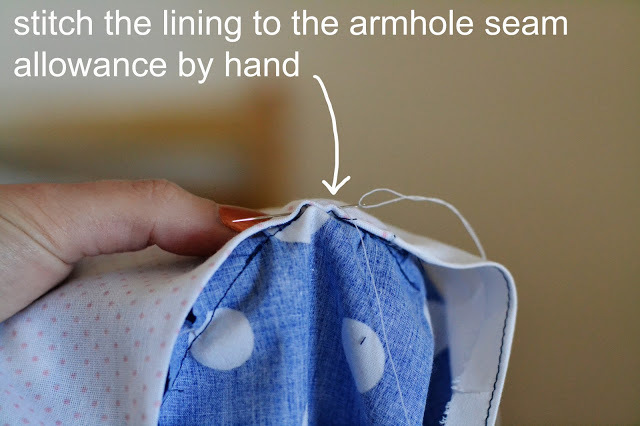 1-Take the sleeve flounces and place them right sides together. 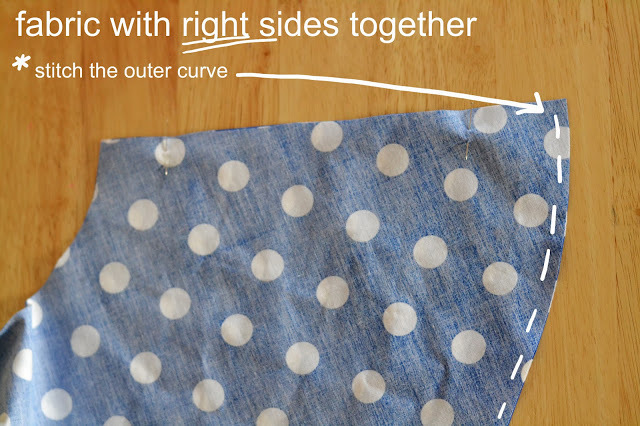 2-Remember to press flat (if the curve isn’t round, notch more closely but be careful not to cut into your row of stitches). 3-Add as many flounces as you want (I have two, one blue, one white). 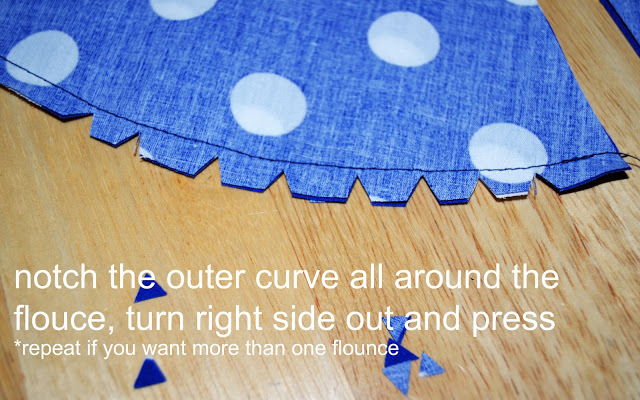 4-Sew the flounces together at inner curve. 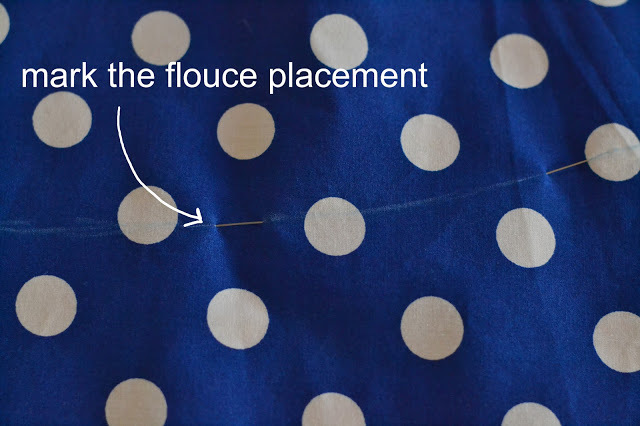 6-Pin the flounces to the sleeve right sides together (for example: blue against blue). 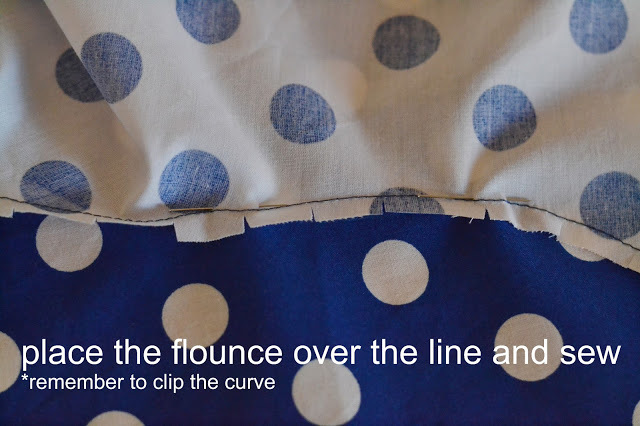 Remember to clip the curve of the flounces so it’s easier to pin. 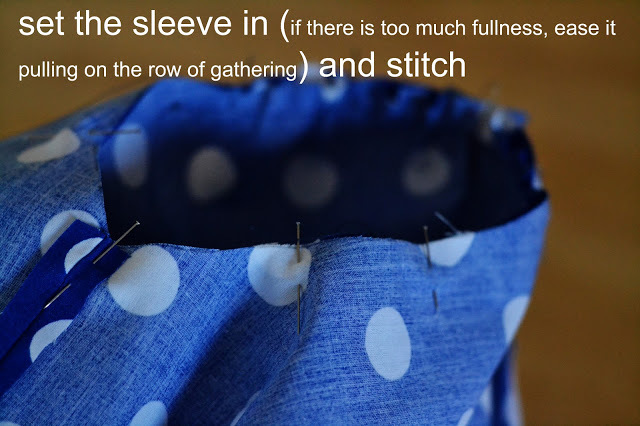 7-Stitch the flounces separately, press the seam allowances open, finish the edges as you prefer (zigzag, serger, bias binding…). There you go for the moment! I hope it was useful and I will post the skirt explanation tomorrow and the final pictures during the following days. Now excuse me, I have to finish my make up for the party… Bye! 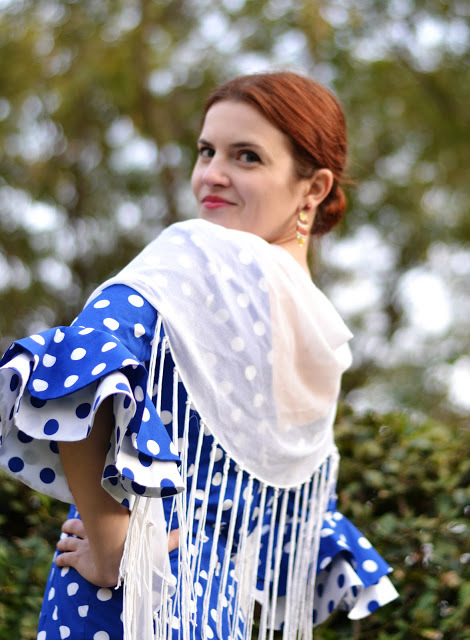 I hope you are ready for some flamenco today as this will be the first part of a long challenge for me. 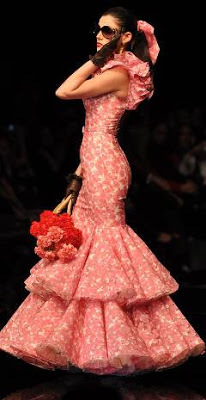 Do I need to remind you that I decided to make myself a flamenco dress? If you need a little trip on memory lane, you can find my inspiration in the last post. This project will be done during my week-ends so here is what I did on Saturday: pattern making! (First, I would suggest you to use a fitted dress pattern with princess seams and possibly with sleeves that fits you perfectly. If you feel really confident in your pattern making skills, then why not draw the whole dress, but that’s a lot more difficult. 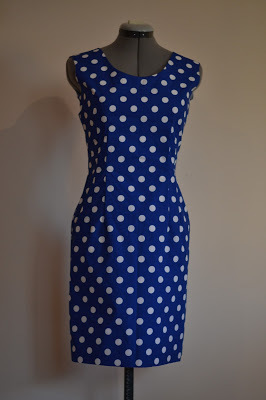 Personally, I am using Butterick 6582, a fitted dress pattern with darts that I tested before and that fits great. See the modifications in the following list). 1- back dress (cut 2). Modifications from the original pattern: I lowered the neckline and redrew the armhole to allow space for the sleeve to be sewn in. 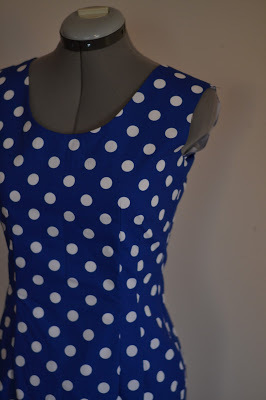 2- front dress (cut 1 on fold). Modifications from the original pattern: I raised the neckline and eliminate the gathers on the shoulder. This means the front also had to be reshaped slightly in order to avoid the neckline to gap from excess of fabric. 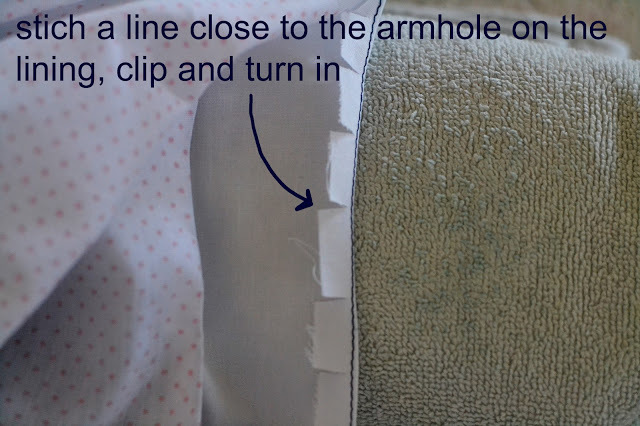 The armhole was redrawn as well. 3- sleeve (cut 2). I used a Burda sleeve as a model and cut it above the elbow. 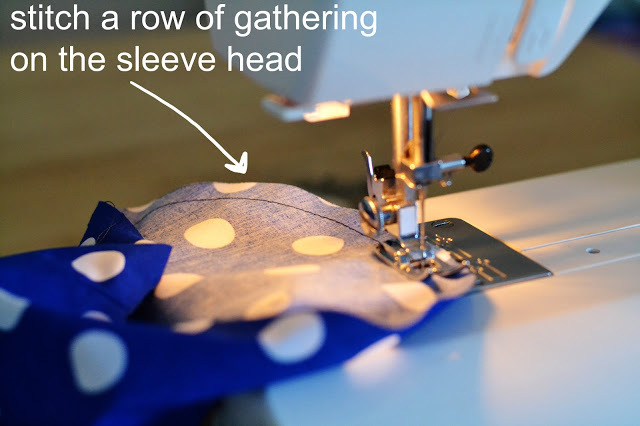 It is a very basic sleeve pattern I often use. Be careful, it has to be quite fitted! 4- top sleeve ruffle (cut 2). Now the fun part: please take your calculator out and be ready to scratch your head. I measured the width of the sleeve (mine: 31 cm) and divided by 3.14 to know the diameter of the inside circle of the ruffle (9.87 cm). Then you decide what length you want your ruffle to be, measure the distance from the circle you just made and draw the outside circle (mine’s 12 cm long). 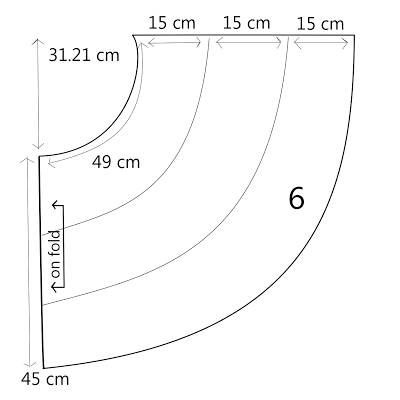 6- skirt (cut 1 on fold). 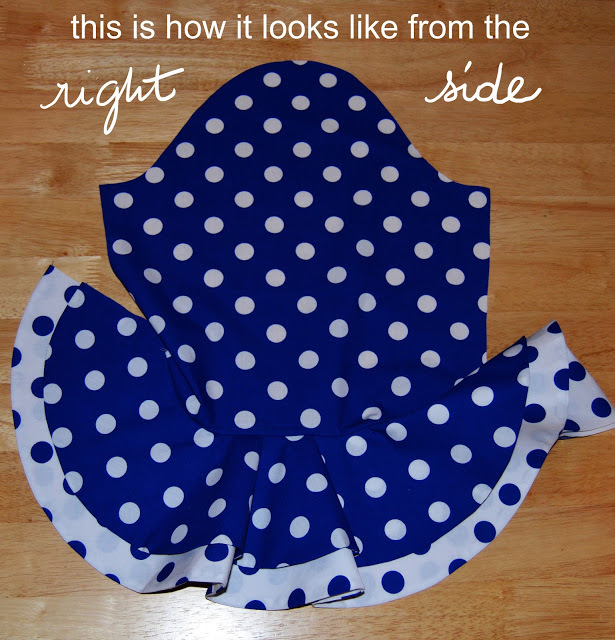 The skirt pattern is a half-circle, so you only need to draw 1/4 and place it on fold. I measured the dress bottom (where you will join the dress and the skirt parts) and obtained 49 cm (front + back – seam allowances). 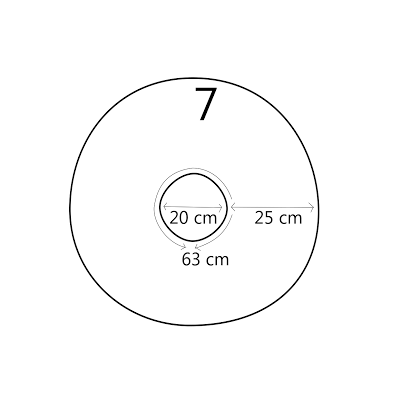 I need to multiply that amount by 4 to obtain the circumference of the inner circle to draw: 49 x 4 = 196 cm. 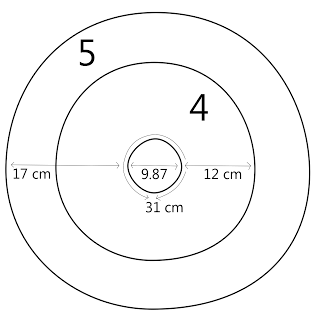 And then to find the radius: (196 / 3.14) / 2 = 31.21 cm. (98 + 160 + 216) / 63 = 7.52 ——- 8 ruffles. If, like me, you are planning on using contrasting fabric, then prepare yourself for more mathematics. 1rst ruffle is blue: 98 / 63 = 1.55 ——- 2 ruffles. 2nd and 3rd ruffles are white: (160 + 216) / 63 = 5.96 ——- 6 ruffles. 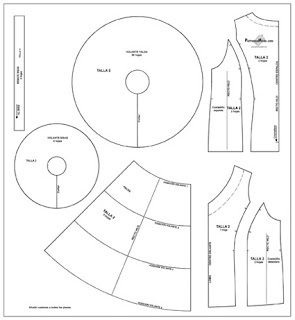 Next week end, I will be cutting all my pieces and hopefully start on the bodice. I hope that was useful and that it made sense. If you have an question, feel free to ask. Have a nice week. 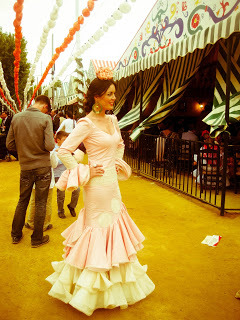 I have just realised that February is coming very soon and that means that the Sevillan Party I will be attending as well. And I don’t have a dress! Or a pattern for that matter! But the crisis is avoided: I have the fabric. This week-end, while searching the internet for inspiration, I found Claudia’s blog Entre cirios y volantes and I went crazy looking at all the amazing pictures she posted. 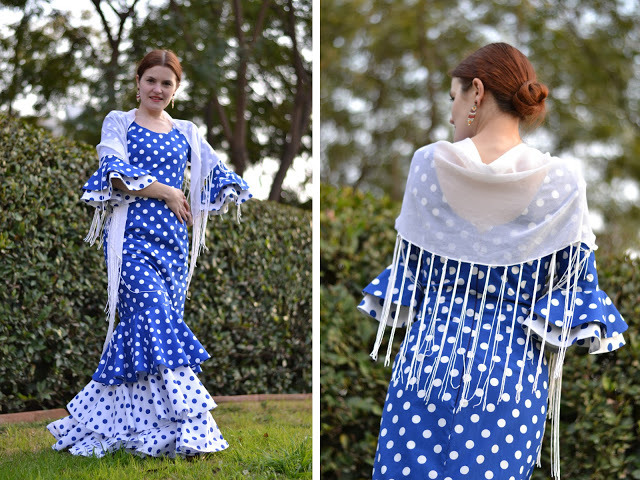 Her blog is dedicated to the Flamenco world and particularly about fashion shows, advices, inspiration, makeup and traditions. I sure found what I was looking for! 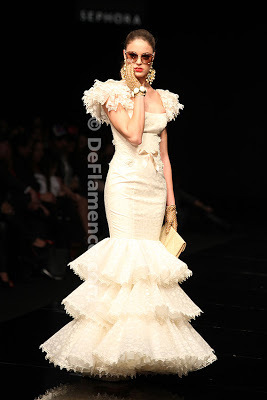 I thought I would show you my favourite looks and then explain how I am going to make the dress. Voy a enseñaros mis estilos favoritos y luego explicar como voy a hacer el traje. As I said on the fabric post, the main fabric will be the blue one. I think it will look better with my fair skin. I will base the bodice and skirt-just-above-the-knee on the Butterick 6582 pattern I have used to make my last dress, the burgundy velvet one as the fit was spot on. I just have to make some alterations to account for above-the-elbow sleeves. 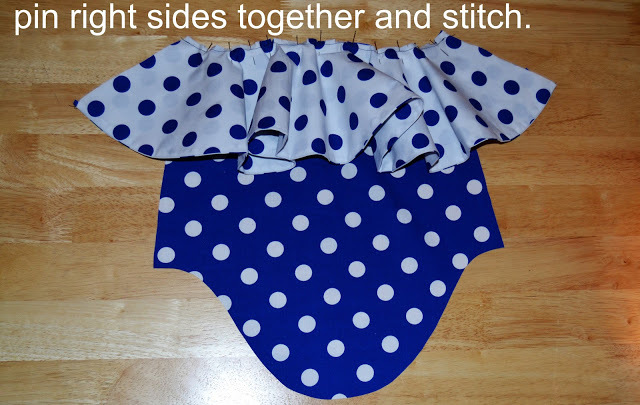 There wille be two ruffles on the sleeves, the top one in blue and the bottom one in white. The skirt/underskirt will be white and there will be three ruffles attached to it (the first one in blue, the other two in white). I just hope I have enough fabric: 3 meters in 1,5m width in each colour (what the girl in the shop recommended). Now I have to find time during the week-ends to accomplish this challenge and I have until the end of February. I want to document the pattern-making and sewing process so I will be able to share my progress with you. 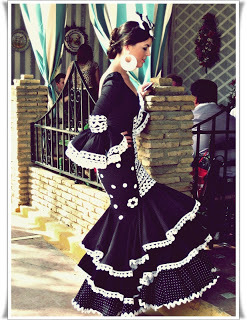 And if you have any knowledge or questions on Flamenco dresses, please let me know.